Introducing kids to multiplication and division can be difficult. All kids have known is counting and addition, so helping them make the transition from counting one by one to then adding fluently to then multiplying fluently takes time and patience and lots of practice. There are so many ways to do this, but today I want to focus on multiplication and division with LEGO bricks. 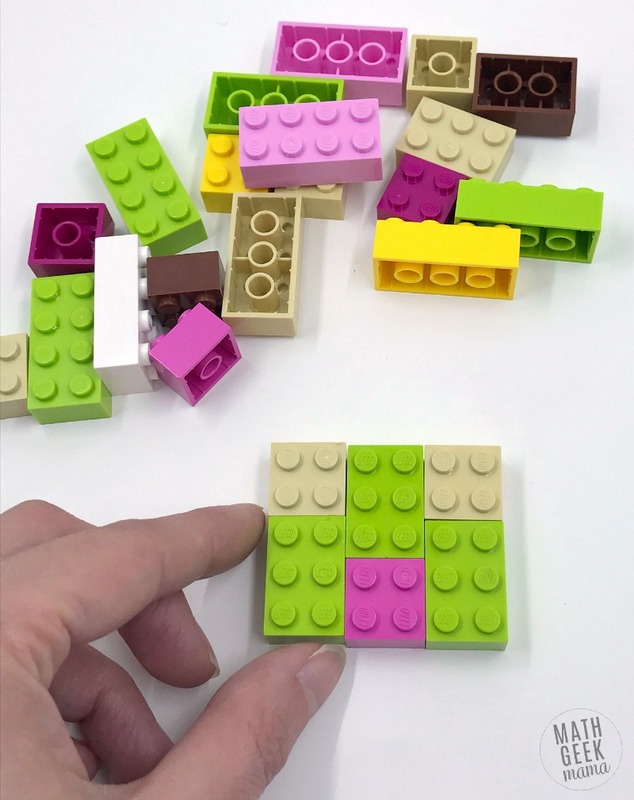 Most kids LOVE building with these tiny blocks, and so they find it fun and less intimidating to do math when they get to use LEGO! 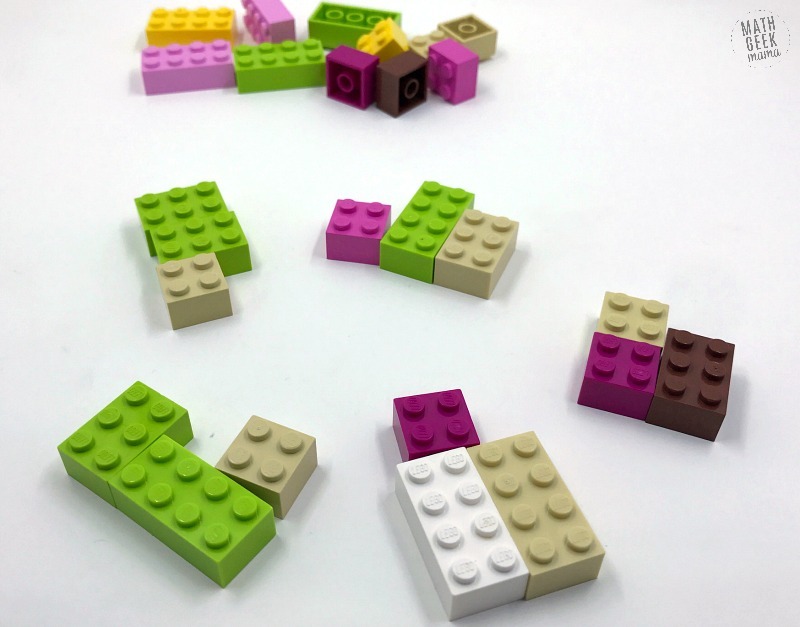 Find ideas for LEGO multiplication and LEGO division below. If you want a quick snapshot, watch the video below. Then read on to see an in depth example of each multiplication model. There are lots of different ways to represent multiplication. But the easiest place for kids to start is to think of it as equal groups. This means you have sets of objects (or things or people), and each set has the same number of objects. For example, I have four kids. And to keep things fair, I have to make sure they all get the same number of snacks or cookies. So if I give each child 4 vanilla wafers, we can think of it as 4 groups of 4. We can show this with multiplication as 4×4. After practicing this several times, you can grab a white board and ask them to write a number sentence to represent their groups. If they struggle, ask them again how they found the total. This may take some digging, but they either counting all the bricks one by one, adding the groups (3+3+3+3+3) or skip counted (multiplication). Once you get a better idea of how they see the problem, you can help them write it in math language. I would begin by showing the total as repeated addition. Then you might say, “Wow, that was a lot of addition of 3s. Maybe we can find a faster way to write that. How many 3s do we have?” When they say “5,” you can then show them how to write the same expression using multiplication rather than addition. Once they get the hang out of, you can grab a set of multiplication flash cards and see if they can build equal piles to represent each fact and find the total. Or you can simply call out problems for them to try. Building arrays is another great visual for seeing multiplication as rows and columns. An array is a set of objects arranged in equal rows and columns. 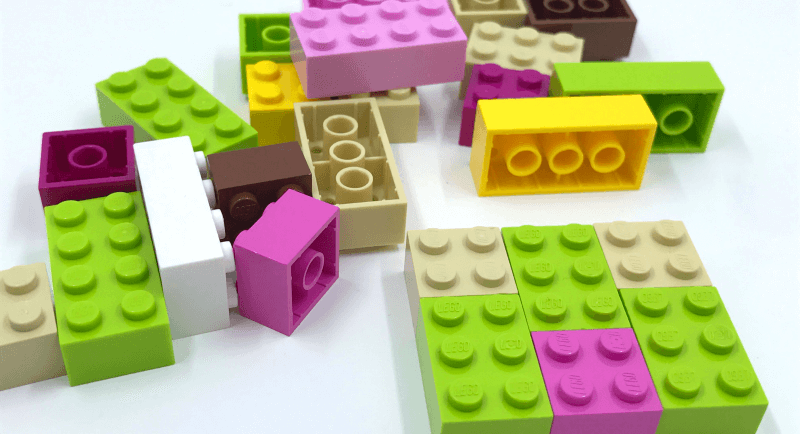 Obviously, any small object can be used to build arrays, but why not use LEGO bricks? Again, you can give kids a set of bricks and challenge them to build arrays given various multiplication facts. Or one of my favorite challenges is to give them a set number of bricks and then see how many different arrays they can make. This is a more open ended challenge and helps kids begin to see the commutative property, as well as see the different factors that make up a whole number. Quick tip: to help kids keep their rows and columns even, let them build the arrays on a checkerboard. An area model is similar to an array, but instead of individual objects, it is a measurement of length and width. LEGO bricks are also a great way to model area if you use each stud (the little bumps on the top) as one unit. For example, to model the problem “6×5,” you would create a rectangle that is 6 studs across and 5 studs tall. You could use a base plate to secure the bricks, but you could also just push them together on the table. Once kids understand what multiplication represents, you can practice facts and skip counting with duplo blocks. Joy in the Home gives an example of counting by 10s in this post, but you could easily adapt this to skip count by any number. You can also use Duplo blocks to create fun puzzles like I showed in this post. Another great visual for kids who are working on mastering their facts is this idea for a 3D multiplication board from Frugal Fun for Boys and Girls! The idea with this 3D graph is essentially the same as what you would find on a multiplication facts grid like this one. The difference, of course, being that kids can see the multiplication facts in 3D! 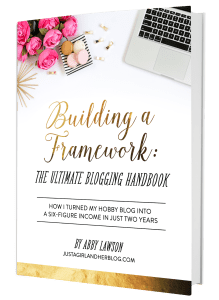 I would encourage you to read her post and try out a version for yourself! 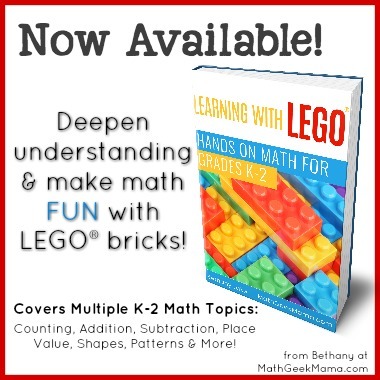 Want some done for you practice with LEGO multiplication? 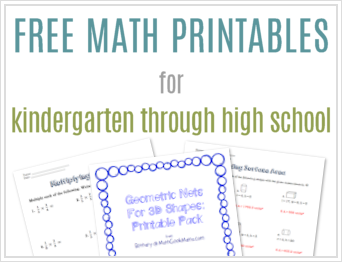 This collection covers multiplication within 5 as equal groups, arrays and word problems! 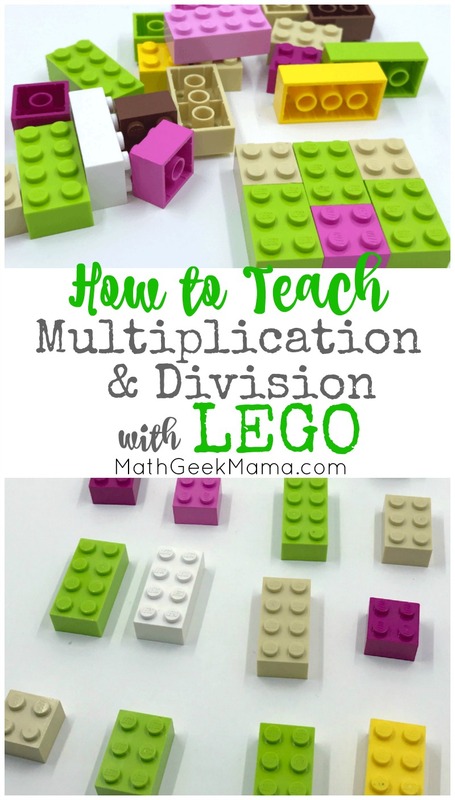 Once kids have mastered multiplication (or are still learning and exploring) you can use LEGO bricks to introduce division as well. You can use all the same visuals and models as multiplication, only now the question will change. Then let kids again sort them into equal piles to find the answer. Because division tends to be trickier for kids to master (and visualize) I always teach it through real world examples and hands on manipulatives like LEGO bricks. This way the math and symbols are not random and meaningless. They have a purpose (sharing with siblings, sorting into bins, etc.). 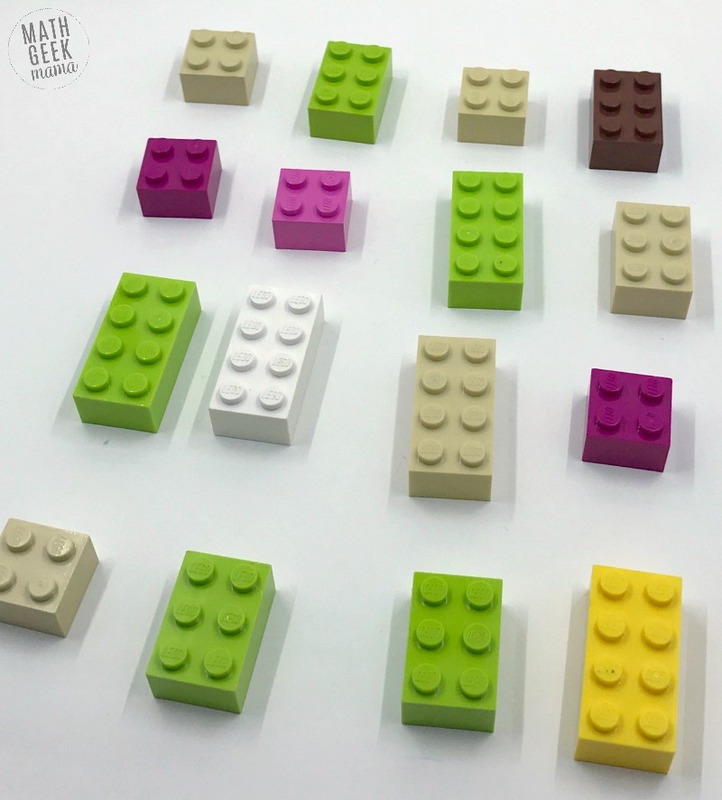 When using LEGO bricks, you can also emphasize that 20 divided by 4 could be solving by creating 4 groups and determining how many are in each group OR putting the bricks into piles of 4 and then determining how many piles you have. Understanding division both ways is important because it helps reinforce that division is the inverse of multiplication. Plus, it is important for kids to understand before they begin tackling more challenging word problems. Having kids practice both ways with LEGO bricks will help build a solid foundation. I love this idea. 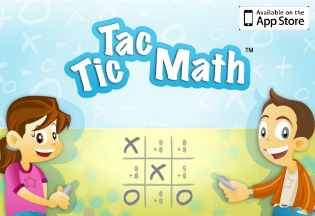 Learn multiplication through play! Just wanted to say thank you so much. I am an educator and just received my own classroom and what my company teach the students is math with Legos. Well, I’d never heard of it. Although my company trained me, I did not fully gasp it. But thanks to your website explaining it so simple.I now know how to teach multiplication and division with Legos.